The drip will be resurrected? The new person in charge issued an open letter. On April 15th, Didi Shunfeng released a letter to everyone on its official WeChat platform, which is suspected of preparing for the re-launch of the business. Hello everyone, my name is Zhang Rui, I joined Didi six years ago and now I am the head of the Windmill Business Unit. As a member of the team, I participated in the early stage of the windmill, experienced setbacks, experienced difficulties, and witnessed the growth of the ride. But this period of time is the most tormented day of my life, and the darkest moment since I was on the line. Two sad events last year made me and my colleagues feel extremely sad and blameless, saddened by the death of life, and blamed us for not fulfilling our responsibilities. The team's classmates fell into deep self-doubt and wondered if their decision to join the ride was wrong, and wondered if our values ​​were really "distorted" as others said. The initial intention of our products as a windmill is to revitalize the idle resources. It is to help the owners to share the travel costs by sharing the empty seats, and to help passengers travel more conveniently. However, the tragedy has made us realize that we have lost the awe of our intention in the process of pursuing scale growth. We did not really understand the industry and did not realize the complexity of offline travel scenes. Responsibility to. Sorry again, we lived up to the trust of users. It is also the support and trust of every user in the past that allows us to persist in advancing the rectification work. In the past, we have been rethinking to understand the security needs of car owners and passengers traveling offline. I also consulted with many industry experts, learned from other companies, and implemented good suggestions in our product rectification. Now, I want to present the team's thinking over the past period, and ask everyone to test and supervise them to help us improve. The essence of the ride is the ride, the owner shares the empty seat on the premise of the established travel plan, so the number of orders received by the owner and the common order area should be limited, and the guidance of the small passenger car rides has also been made. Regulations. In order to prevent security risks to the maximum extent and resist illegal operations, we will strictly limit the number of orders received in accordance with the guidelines, and stipulate that the owners will carry passengers on the commonly used routes, so that the rider will return to the essence of the road. Second, remove the display of personal privacy related information such as personalized avatar, gender, etc. The offline travel scene and the complexity of human nature make us realize that the design of Internet socialized products is risky in the use of the wind, personalized information such as avatar, gender, personal evaluation labels, etc., is intended to be used as the owner The supplementary judgment factor of the passengers, but it provides the criminals with the opportunity to select the infringement object, and lays a hidden danger to the user. In the future, we will only display the necessary information related to travel, and it is forbidden for both parties to edit the content of mutual evaluation. The evaluation label is only related to travel, such as “punctuality, courtesy” and so on. 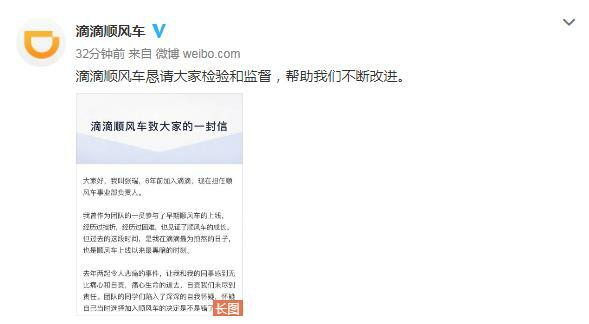 Liu, the murderer of the Zhengzhou incident, was rejected by the platform at the time of registration because he did not meet the requirements. He was then registered by his father's identity document and asked his father to recognize the face. In order to prevent such situations from happening again, we will continue to strengthen the screening of user information, and perform face recognition before the owner of each trip to seriously deal with the situation of people and cars. However, the offline scene is complicated, we are still exploring more effective ways, and we hope that everyone can give us suggestions. In the two incidents last year, there were cases in which other passengers complained about the abnormal behavior of the owner involved in the case. However, due to insufficient judgment of the first-line customer service, the risk was not accurately identified, and the complaints were not properly disposed of. Afterwards, we launched a comprehensive security risk investigation in each link, and invested a lot of resources to upgrade the entire customer service system. The shuttle will also be connected to the specially established safety response center of the Drip Platform. As long as the safety-related complaints are involved, all of them will be handed over to the first person to reduce the probability of misjudgment or backlog of safety complaints. In the safety rectification of the Drip Platform in September last year, we set up a 7x24-hour emergency command center to provide comprehensive support for emergencies, and at the same time set up a “Police Certification Docking Working Group” and optimize the calibration process. After the police enter the line, the link will be sent through the SMS at the first time. After receiving the reply from the police, the police can complete the adjustment work within 10 minutes. These are the improvements we have made to the core issues exposed in the past two cases. In addition, we have also made a lot of explorations on user registration access verification, product flow, and security strategy. We hope to provide users with more security capabilities and tools. Next, we will gradually announce the details of these aspects. We also solicit opinions from all of you and continue to build a safer travel environment. We know that no matter what we do, we can't recover the lost life, and we can't alleviate the grief of losing our loved ones. In addition to our deep condolences, we will also abide by our commitments, do our best to take care of the deceased's family, and do our utmost to improve the safety of travel. The greatest strength of oneself prevents the tragedy from happening again. We will never forget the lost life, life is above everything else, and the dead will rest in peace.